The Mall Drive catalyst area is a regional district. I-26, a regional gateway that not only serves the Neck peninsula but ties the Charleston area to I-95 and the eastern seaboard, bisects the catalyst area and intersects with I-526 directly to the north. Rivers Avenue, Montague Avenue, and International Boulevard, each with exits from either I-26 or I-526 providing direct access to major area roadways, create the framework for this area. The western portion of the catalyst area, framed by International Boulevard, Montague Avenue, I-26, and I-526 and sitting directly north of the Convention Center campus, is primarily a commercial district with small lot and big box retail, hotels, and restaurants. The eastern portion of the catalyst area, loosely framed by Rivers Avenue, Montague Avenue, I-26 and I-526 with railroad tracks bisecting the area, consists of a mix of civic, commercial, and light industrial uses, including the City of North Charleston Municipal Complex. 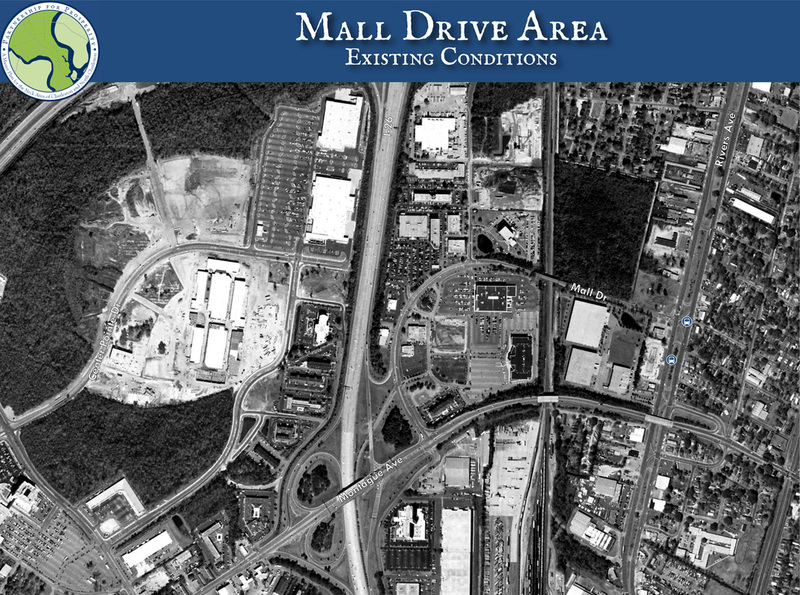 The Mall Drive area is the centerpiece of a much larger area dubbed the “Gateway Entertainment District” that encompasses the Charleston International Airport, the Coliseum, the planned Intermodal Center, Tanger Outlet Center, hotel accommodations, restaurants and North Charleston City Hall. With its regional visibility, this area presents significant opportunity to become an urban center of the region, with offices, retail, multifamily residential and related uses functioning as a well-connected district. Aviation flight path restrictions will likely keep building heights to a modest level, but there is the opportunity for substantial infill of parking areas and vacant parcels to create a true regional center of North Charleston. There are two areas for catalyst opportunities. 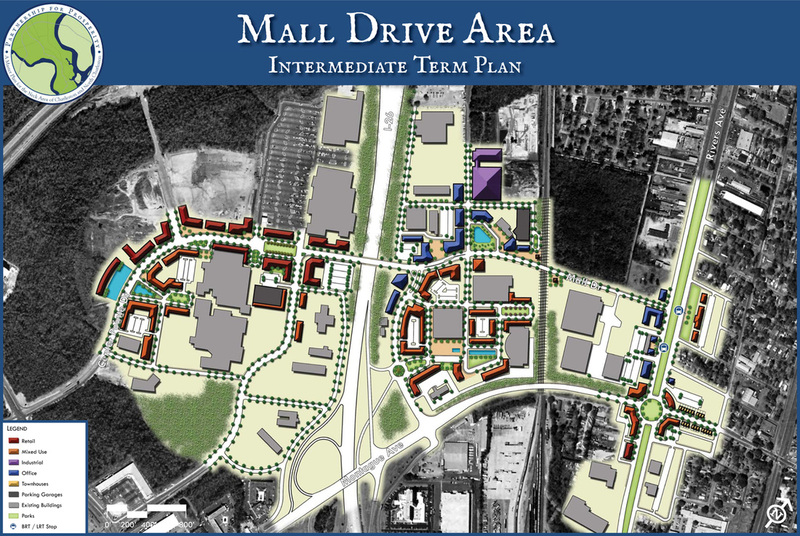 The first is to begin mixed use development in the North Charleston City Hall area, designed around a future location for a commuter rail station. 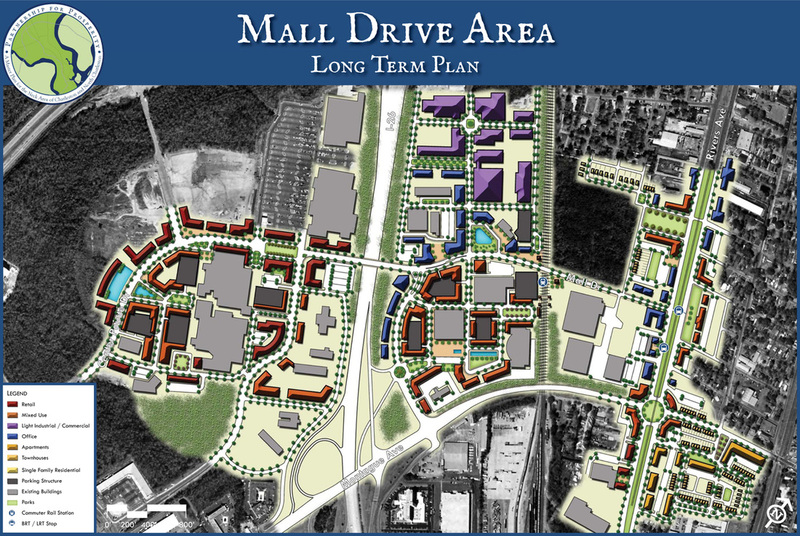 This will not only begin a conversion from larger commercial uses with vast areas of surface parking to a more pedestrian-scaled environment, but also begin development of the mixed use core and density/intensity needed for the commuter rail stop that utilizes multimodal transportation systems and encourages a live, work, play environment. The second catalyst opportunity is located just north of the first area, where the former North Charleston City Council building sits empty. This site occupies a prominent location along Mall Drive and an adjacency to the future commuter rail station, positioning itself nicely to actively participate in the transformation of this core area. 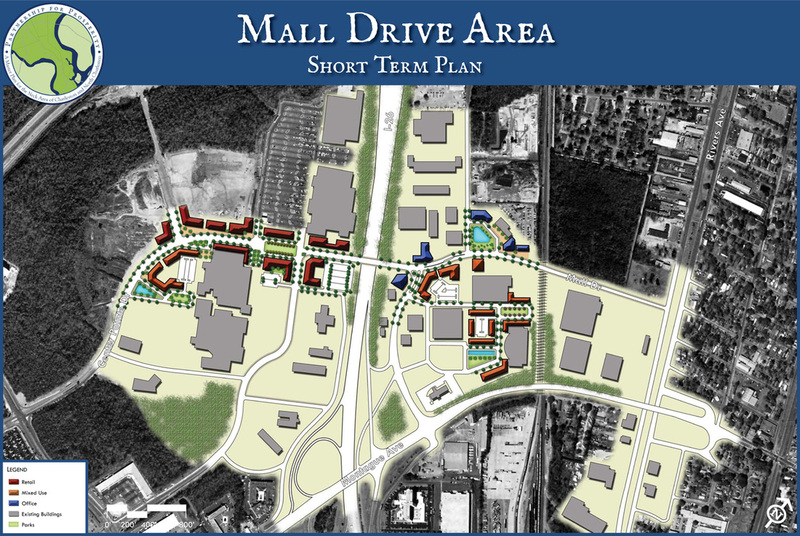 Building sizes in the North Charleston City Hall area are envisioned to be mid-rise (3-5 stories), with higher elevations around the commuter rail transit core. In the Tanger Outlet area, buildings will low-rise (1-3 stories), with some mid-rise (3-5 stories) as focal points. Along Rivers Avenue and Montague Avenue, buildings will be low-rise (1-3 stories) transitioning into existing neighborhoods. Connectivity within the catalyst area will be enhanced by a new circulator street that essentially extends Mall Drive across I-26, uniting the two halves of the area. The regional access and visibility provided by I-26 and Rivers Avenue, combined with airport proximity and rail transit access, can make this catalyst area a prime target for future redevelopment. The preliminary planning level program derived from the Long Term Phasing Concept Plan shows that about 2,000,000 square feet of non-residential uses could be developed in this catalyst area.